Republican nominee Bob Siegrist (right) stands with State Senator Art Linares (R-33rd), who nominated Siegrist to run for the State Representative seat currently held by Phil Miller (D-36th). 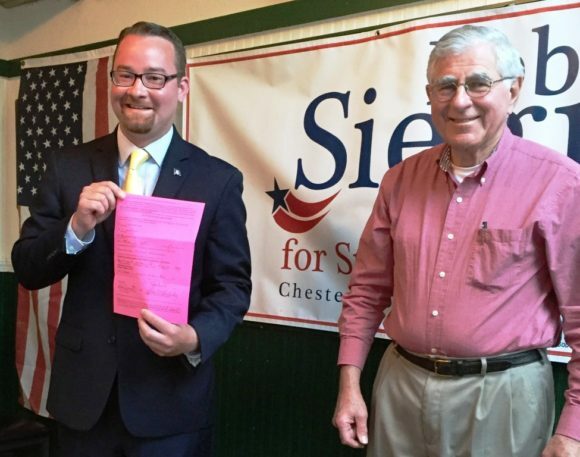 AREAWIDE — Party nominating conventions this week have set up a Nov. 8 election rematch, with Democratic State Rep. Phil Miller’s bid for a third full term facing a challenge from Haddam Republican Bob Siegrist in the 36th House District that is comprised of the towns of Chester, Deep River, Essex, and Haddam. 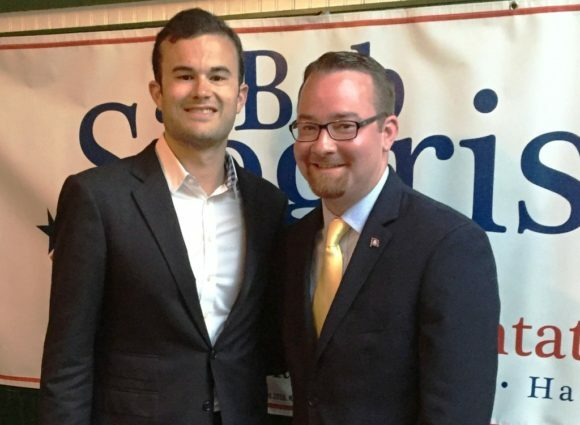 In 2014, Siegrist was awarded the GOP nomination in June, following the withdrawal of a candidate nominated at the convention in May. After a spirited campaign, Miller was re-elected on a 5,522-4,701 vote, with Miller carrying Chester, Deep River and Essex and Siegrist carrying Haddam. Miller was elected to the seat in a February 2011 special election while serving his fourth term as first selectman of Essex. He was elected to a full term in 2012. 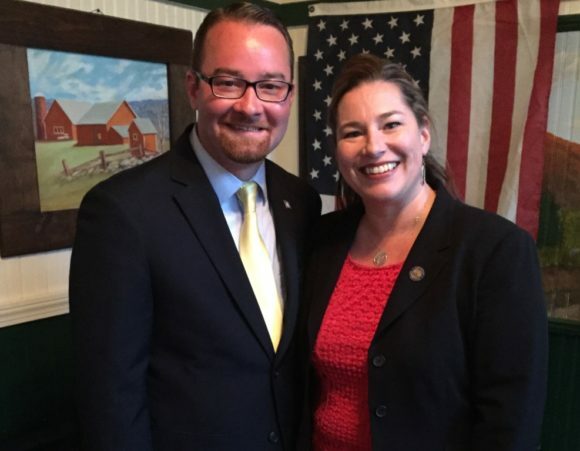 State Rep. Melissa Ziobron (R-34th) offers congratulations to Bob Siegrist. Bob Siegrist (left) stands with Ed Munster. In brief remarks after the nomination, Seigrist said he would focus on priorities and work to represent all of the residents of the four district towns. Seigrist, 32, currently works with a landscaping business after working previously as a bartender before his 2014 campaign. Miller told the delegates that this year’s legislative session, which struggles with a looming state budget deficit, mirrored the situation when he arrived at the Capitol in late February 2011. Miller defended the 2016-2017 budget plan approved by the House last week on a 74-70 vote, noting the plan made tough choices to address the budget deficit, including $900 million in cuts, while avoiding tax increases and a deeper cuts to education funding. Miller said he was also proud to vote last week against a Republican amendment that would have ended the Citizen’s Election Program funding for legislative campaigns. Miller said the program, established in 2007 under a law pushed by his predecessor in the 36th District seat, current Deputy Secretary of the State James Spallone, limits the influence of large campaign contributions while also helping to level the playing field for challengers, including Siegrist. Spallone, an Essex resident, was chairman of the Tuesday convention.